This page may require cleanup to meet basic quality standards. The specific problem is: Essential improvements is wayyyyy too big.. You can help by modifying the article. The discussion page may contain useful suggestions. The DirectX 10 renderer of the game runs poorly with modern Windows, particularly with VSync. Using DX9 is strongly recommended. See Bouncing NPC glitch. Mods are available, many of which fix bugs and improve certain features. See Mods. SecuROM PA DRM, 5 activations on 3 PCs. The Fortune's Edition is a complete edition containing the base game and the Fortunes Pack DLC. Released as a free download. Patch 1.03 removes the activation requirement and allows the game to be played without the disc. Add the SkipIntroMovies="1" attribute to the <GameProfile> tag. DLC containing extra missions from a promotional deal between Ubisoft and Intel. Download mod tools from moddb. From the archive, extract the contents of the WobFC2DUNIAxxx folder into the <path-to-game>\modding\ folder, creating this folder if it doesn't exist. Run bootstrap.bat to unpack Far Cry 2's resource file into your modding folder. After changes have been made to the unpacked resources, run build_patch.bat to pack the modified resources back up into patch.fat and patch.dat files. Copy patch.fat and patch.dat into <path-to-game>\Data_Win32\, backing up the existing resource files before overwriting them. This process should work even with mods installed. Mods are typically distributed as patch.fat and patch.dat resources. The mod tools will unpack these resources if installed, so when the resources are repackaged after making these improvements the mod should be preserved. 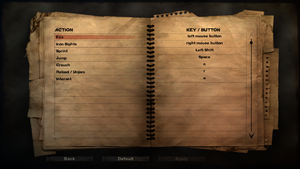 Far Cry 2's resource file contains a set of mouse sensitivity multipliers which augment the sensitivity slider in the options menu. In the original\patch\config\inputactionmapcommon.xml file, change the sensitivity attributes within each <MouseFilter> element to the desired scalar. Far Cry 2 clamps mouse speed once it reaches a certain rate. This can be problematic for player who use high DPI mice or low sensitivities. In the original\patch\config\inputactionmapcommon.xml file, remove the maxOutput attributes from each <MouseFilter> element. Far Cry 2 uses a multithreaded renderer, meaning the rendering happens in a thread separate from the main game loop. This pipelining, which is performed by default, increases framerate substantially but at the cost of one frame of latency. 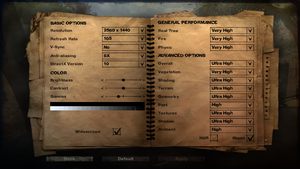 Since Far Cry 2 needs to be framerate limited to avoid certain bugs, this tradeoff can be beneficial in cases where framerate is capped well below the system's capabilities, or in cases where the player values low latency over outright framerate. In the original\patch\engine\settings\defaultthreadingconfig.xml file, set ThreadCnt="0" on the <ThreadSetting id="RENDER_THREAD" ...> element. Additional threads can be allocated to the PHYSIC_THREADS and JOB_THREADS to regain some lost framerate. 4 physics threads and 2 job threads appear to yield the greatest performance increase on quad core machines. Increasing job threads too far can have catastrophic effects on performance. Open the cheat console with 0+~. Only works in DX9 mode. -GFX_HemiQuality 2 -GFX_LeavesShadowRatio 1 -GFX_SunShadowRange0 14 -GFX_SunShadowRange1 30 -GFX_SunShadowRange2 160 -GFX_MaxHemiMapDistance 10000 (without commas, and with hyphens on each). Menus and loading screens are stretched. 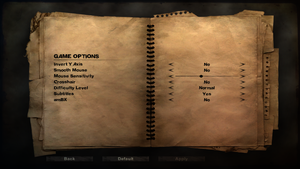 Make changes on the main menu, changing aspect ratios in-game may result in stretching and other errors. Use Widescreen Fixer for Steam version. Use Hunter's Far Cry 2 Update - GOG for GOG.com release. MSAA up to 8x. SGSSAA can be utilized through anti-aliasing compatibility bits 0x000010C1 under Nvidia Inspector. No frame rate cap. Use Far Cry 2: Redux to avoid the Bouncing NPC glitch. These settings cause in-game blurriness. Open GamerProfile.xml with your text editor of choice. Set the file to read-only. This does not change the blur/dark effect caused by over-sprinting to the point where the player is forced back to walk. You can change values also to your liking, e.g. if you want DoF but not motion blur, simply change 0 to 1 in GameDepthOfField and CinematicDepthOfField. Use the -RenderProfile_MaxFps X command line argument where X is your preferred max fps. If you see screen-tearing, give the game some extra frames to render. Alternatively, the gfx_maxFps console command can be used to set the framerate limit in-game. Some minor commands, such as exiting turrets and operating the wristwatch, are permanently bound to the default WASD controls. Can be modified further by editing Sensitivity value in GamerProfile.xml. EAX 3, DirectSound3D. In-game EAX 3 can be upgraded by replacing eax.dll in Far Cry 2\bin folder, with eax.dll version 4. Artifacts while playing music may occur (you can disable music in game options). Updating the library will greatly enhance game sound positioning and audio quality while using Alchemy to restore EAX (Alchemy for all soundcards). This happens if the "interact" key is rebound to anything other than the "default" (E). In order to exit the turret if key is rebound, E must be used. As of patch 1.03 any tape found in the Southern district will play as the ninth tape. High FPS will cause errors in character animations. At very high FPS this can be a game-breaking bug as important NPCs can't complete their dialog to progress the story. Use the -RenderProfile_MaxFps X command line argument where X is your preferred max fps. A max FPS of 60 is recommended. Your phone rings, you answer it, but nothing happens. This bug isn't game-breaking, but you miss out on the dialogue. Alt-tabbing out of the game may cause the resolution to reset to 1600x900. Change your Resolution to something besides your preferred choice. Now change the Resolution back to your preference. Certain audio devices (namely older Realtek integrated audio chips) aren't compatible with the audio in the game and will reverse all channels or make the back channel primary and the front channel near inaudible. Find the line DISABLE_OPTIMISATION and set the value to FALSE. The Nvidia 301.24 BETA drivers can cause Far Cry 2 to load in windowed mode, minimizing the game can also cause the same effect. This is easily resolved. Launch the game and from the menu select Options then navigate to Display. From here simply change your DirectX version to 9 and click Apply. Alternatively you can simply press Alt+↵ Enter to go back into full-screen mode, however some users may have unexpected issues like vsync turning off even if it's set on. 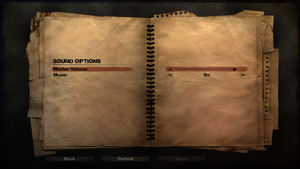 Change "Fallout4" to "Far Cry 2" in the Notepad, save. -exec filename Parses console commands from the file named filename in your Game data directory. Known to work for files with a .CFG extension. Execution results can be viewed in-game by opening the console with ~. Under Profiles type Far Cry 2. Under Ambient Occlusion compatibility insert the flag 0x0000002D (MechWarrior Online). Under Ambient Occlusion setting select your quality of preference. Infamous Fusion - Major mod with countless improvements on realism, graphics, weapons, animations and gameplay. Far Cry 2 Rewards - General improvements/balancing alterations. Dylan's Realism Mod - Revisions to enemy health, diamond prices, enemy AI, and other balance changes. Far Cry 2 No Malaria and Infinite Sprint - Patch that only disables malaria attacks and removes the cooldown on sprinting. 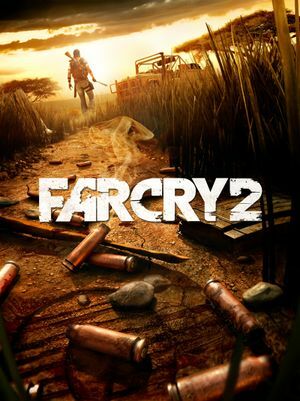 Far Cry 2 New Dunia (+ Beyond Ultra Graphics) - Major mod with HUGE improvements on graphics, weapons, AI and gameplay, for player who wants more detail and vivid graphics. 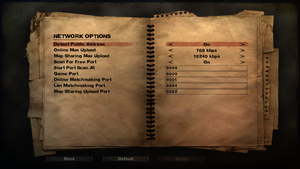 Multiple saves and user created maps will increase the amount of needed hard disk space. ↑ 1.0 1.1 File/folder structure within this directory reflects the path(s) listed for Windows and/or Steam game data (use Wine regedit to access Windows registry paths). Games with Steam Cloud support may store data in ~/.steam/steam/userdata/<user-id>/19900/ in addition to or instead of this directory. The app ID (19900) may differ in some cases. Treat backslashes as forward slashes. See the glossary page for details.